Aliness UbiquinoN Natural Coenzyme Q10 is a top-quality supplement containing natural substance supporting work of cells, improving skin condition, carbohydrate-lipid metabolism and circulatory system condition. Responding to customer needs, the preparation was contained in capsules, which can be taken by vegans, people with gluten, lactose, soy intolerance or avoiding GMO products. Coenzyme Q10 (ubiquonone) is an organic compound from the quinone group that occurs in the mitochondria of every cell and participates in the energy production process. However, CoQ has definitely more functions, including the reduction of free radicals, which can prevent the development of many diseases. Its supplementation in case of nutritional deficiency (restrictive diets, depression, state after heart attack) has a positive effect on the condition of blood vessels, and at the molecular level it maintain energetic homeostasis. Functioning of cells is very similar to human work. Each organellum, as well as many proteins concentrated within them, fulfils its specific tasks that are impossible to perform without ATP - metabolic energy. It is the same in everyday life - every man has to devote his time to complete a given job, but most importantly, he must spend a lot of energy to accomplish it. ATP is produced in mitochondria, colloquially known as ‘energy centres’ of cells, in a multi-stage synthesis process. Many chemical compounds are involved in it. One of them is coenzyme Q10, which is part of the so-called respiratory chain. This compound mediates the transmission of electrons obtained in earlier stages of cellular respiration from burned carbohydrates and fats. As it can be easily seen, CoQ deficiency can have serious consequences. This condition occurs for example in people taking popular lipid-lowering drugs, which inhibit the synthesis pathway, thus revealing disturbances of respiratory processes, especially in muscle tissue. Worse mood, drowsiness, definitely easier fatigability, muscle aches, problems with concentration, increased susceptibility to infection - these are just some of the symptoms suggesting the need for coenzyme Q10 supplementation. The omnipresent advertised products rich in antioxidants evoke anxiety in many people, as they mention the mythical free radicals. What are they actually? They are compounds of destructive power, which particularly affects cell membranes and genetic material, leading to the development of inflammation. The body has its protective mechanisms against them, but they are not always efficient. In such situations, it is worth supplementing antioxidants. Coenzyme Q10 has such properties because of its ability to attract free electrons. This mechanism is similar to what occurs in the mitochondria. In addition, it participates in the transformation of vitamin E, allowing to obtain its active form. Tocopherols are also great eliminators of free radicals, especially within biological membranes. It is true that the average life expectancy in the last few decades has been significantly extended, but it is worrying that cardiovascular diseases are still the unfortunate primary cause of mortality. The most common ailment that leads to strokes and heart attacks is advanced atherosclerosis. Its development is conditioned by a harmful lifestyle - chronic stress, insufficient exercise and poor diet. Consuming processed foods that are the source of cholesterol has also negative side effects. Its burning in the mitochondria releases a very large amount of free radicals, which are able to oxidise cholesterol-carrying lipoproteins. This results in the transformation of LDL (‘bad cholesterol’) into ox-LDL (the actual ‘bad cholesterol’), which can be deposited in the walls of the vessels with the help of immune cells. Due to its antioxidant properties, coenzyme Q10 prevents the oxidation of lipids within the vessels. Thanks to this, it indirectly prevents the deposition of cholesterol in the arterial wall, and thus prevents the development of atherosclerotic plaque and decreases the risk of unpleasant complications. Scientific observations have confirmed the effect of coenzyme Q10 on other organs and tissues. People suffering from cardiovascular diseases also very often struggle with abnormal blood sugar level. It may be caused by impaired pancreatic function in terms of insulin secretion. CoQ supplementation facilitates this process, additionally lowering HbA1c (glycated haemoglobin). It is a marker, the increase of which could indicate the development of diabetes. Dermatological products often have coenzyme Q10 added. Skin support is also possible ‘from the inside’. Research has shown that higher CoQ concentration in skin cells contributes to the intensification of collagen and elastin production. These proteins are responsible for its elastic properties, ensuring adequate firmness. In addition, coenzyme Q10 as an antioxidant reduces free radicals caused by the harmful activity of UV rays, preventing the destruction of structural proteins. To sum up, Aliness UbiquinoN Natural Coenzyme Q10 is a preparation recommended to those who want to take care of the cardiovascular system, and at the same time support cellular energy homeostasis. 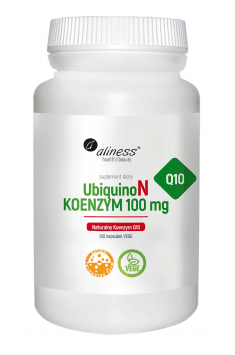 UbiquinoN Coenzyme Q10 100mg 100 caps. Take one capsule once a day during the meal. The preparation is intended mainly for people who may struggle with deficiencies of this endogenous substance, due to restrictive reduction diets, smoking or serious diseases. Coenzyme Q10 is a fat-soluble compound, so it is worth taking it during meals containing this macro-nutrient. Safe and effective doses of the supplement vary between 90-200 mg daily. Anyone who wants to prevent cardiovascular disease, should first of all modify their lifestyle (increase physical activity, reduce the consumption of processed products), because the supplement has only a supporting role. Bulking agent: microcrystalline cellulose, capsule shell: hydroxypropylmethylcellulose.